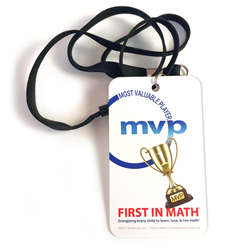 Present this First In Math "MVP BADGE" to your Most Valuable Players and top First In Math® students. 3" x 5'' flexible and lightweight Teslin badge. Includes plain breakaway lanyard - $2.95 each. Made in USA.